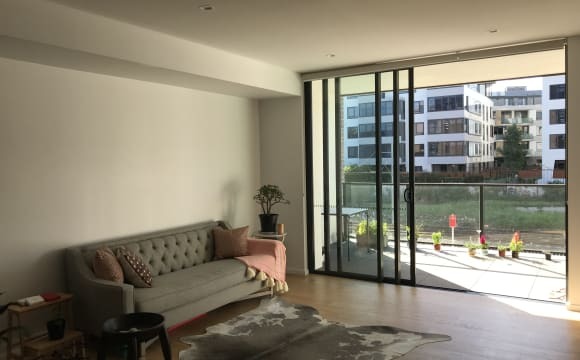 Hi guys, we have 2 great sized double bedrooms that come fully furnished with new furniture in a modern and very clean home in the heart of Lewisham. 5mins walk to local shops and 10mins walk to the train station, cafes and some really awesome pubs! City bus across the road! 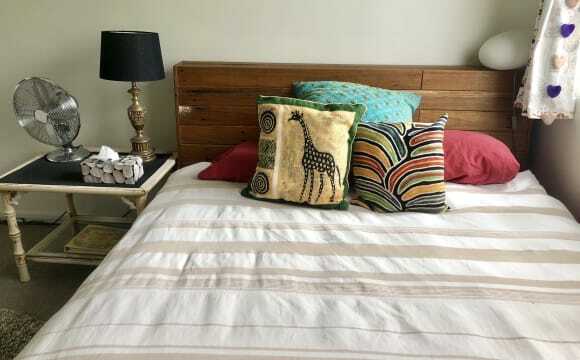 Room Prices - ALL BILLS INCLUDED: Double Bedroom: Singles - $270 | Couples - $320 Master Bedroom with ensuite: Singles - $310 | Couples $360 FULLY FURNISHED WITH REGULAR CLEANERS! 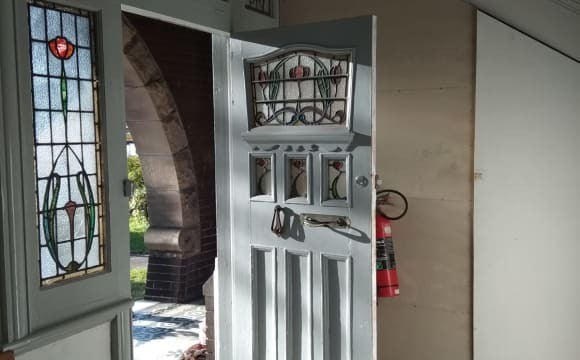 Our lovely home includes the following: Brand new fully equipped kitchen House is fully furnished throughout with modern furniture and appliances. 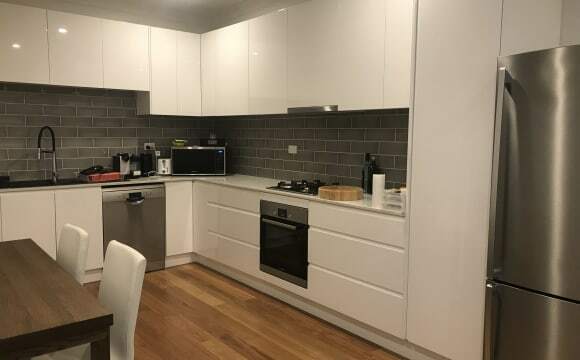 Regular Cleaners for the communal areas Unlimited Cable Wifi Internet Living room with TV and modern comfy couches Bed linen is optional Bond is just two weeks rent City Bus Stop at your door step! Urgent- 1 week free! I am going on holiday on Friday so I won’t be able to do more visit Room available from now I offer one week rent if move in before the Monday 29th Private room Lewisham $350 single - $390 couple Available from Now. Couple preferred Inspections between 6-9pm &amp; weekend! Big and beautiful house located next to transport (light rail to darling harbour , train to central, bus to anyway) We live there since more than two years now, we just love it. We have a nice backyard with a hot Jaccuzi for the cold days. You room will included all necessary furniture and a huge king size bed! We also have Netflix for the lazy day. Gyms, restaurant and shopping are a step away. We included everything with the price, please don’t hesitate to contact if you need more info! The picture are a bit outdated (just lazy to take more) but ask me and I will be happy to send few more. You will be sharing the house with my boyfriend (canadien) and me, we both work full time and love to do some activities on the weekend( kayaking, canyoning, hiking...). The Italians are both student, very nice and respectful people. Ileana is a singer and Matteo a PHd: student full time job. We love cooking all together, cake, BBQ, italien pizza, real pasta... We all very busy, we like to have someone clean, nice and respectful. We all very easy going people! Private rooms! The house is a very spacious and recently renovated. There is a big kitchen, living room with bathrooms both upstairs and down stairs. Fantastic Location! Only 3 minutes walk to Lewisham train station (less than 15 minutes to Central) and right beside a bus stop which goes to Campsie area and the opposite side goes to city. There is also light rail and the house is just down the street from bus stops which take you straight into Newtown. Right around the corner from Petersham TAFE. This is a perfect location for USYD students! You can pretty much access all parts of the main campus very easily due to all the different transport options surrounding the house. Looking for students or professionals that want to be near the city without the price tag. Rent includes all bills (water, electricity, gas and internet) and this includes weekly cleaning of common areas. If you are into sharing, a couple or not, we are happy to provide the furniture needed for sharing with two people. which will be only $190 each! Price listed are for 1 person to occupy the whole room. This is a very big room! ROOM -$425 for couple ! 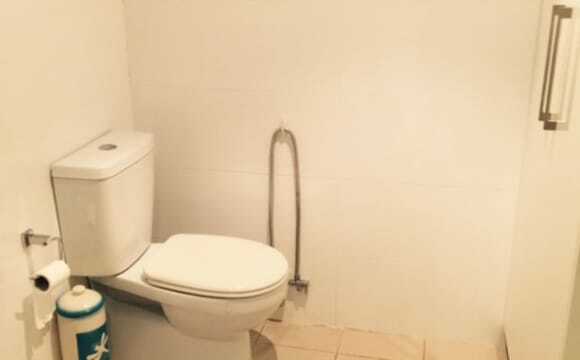 !Great Share house With great house mates .2 very large bathrooms ,one with spa bath .We have an internal laundry. Tonnes of light. Lots of shared living spaces and your own private space too. 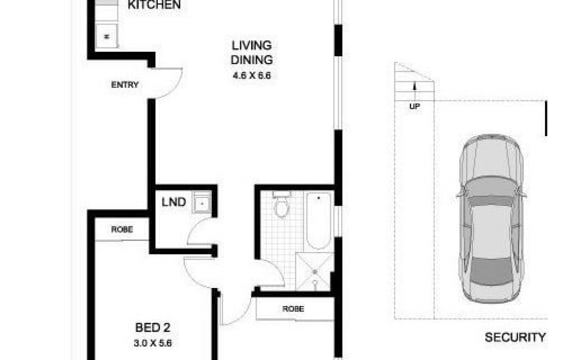 Large bedrooms, built in wardrobe. Walk to Lewisham Train Station or Light Rail. 5 stops to Central on the train. Buses also an easy walk. Air conditioned. Beautiful established gardens and outdoor seating area With bbq so you can enjoy cooking outdoors This is not a party house!!!!!. Housekeeper for all common areas every two weeks at no charge to tennants . All bills and wifi included in rental bill Housekeeping included. Couples and Single shared room. Close to Marrickville, Newtown, Enmore. Close to University of Sydney, University of Technology, RPA Hospital. I am wanting clean tidy and considerate housemates Please so we can all enjoy our house !! This is a large, spacious house less than 10 minutes walk from Lewisham Train Station, close to Petersham and Dulwich Hill shops, and the Petersham pool. It is a heritage listed terrace, recently renovated, with high ceilings and plenty of room. We have a sizable kitchen (with dishwasher), dining area, storage room, lounge room and laundry, as well as back deck and yard. The room is unfurnished. On-street parking is available. An additional $20 per week will cover electricity, gas, internet and the cleaners. Brand new home with great view to Luna by Meriton playground with BBQ facilities and cafes. 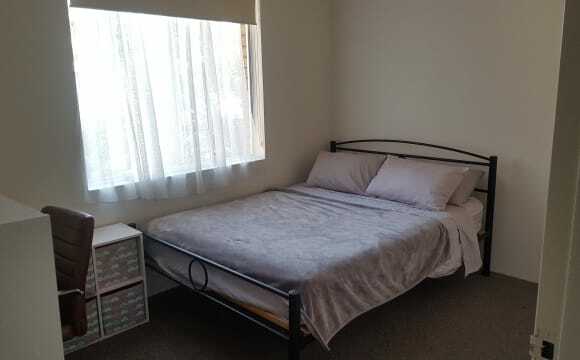 * 2-3 mins walk to both Lewisham railway station and Lewisham West light rail station * Direct train 14 mins to Central or 4 mins to Ashfield Shopping Mall * 24 hour gym and hair salon across the street ------------------------------------------------- Fully furnished master bedroom with ensuite, walk in robe and room privacy key lock. 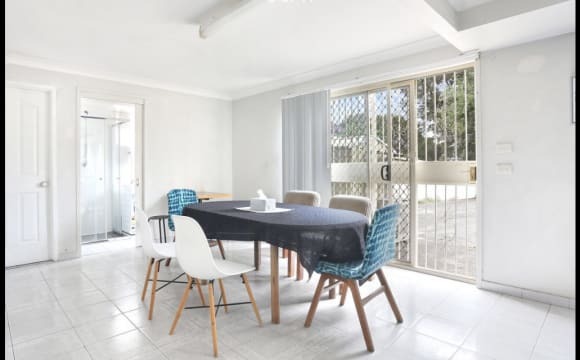 ------------------------------------------------- Bills and unlimited internet access are additional $20/week/person (no air-con or heater) Cookware and kitchen utensils are all provided for sharing. Though we are classified as Dulwich Hill, We are on the boarders of Lewisham and Summer Hill. Walking distance to shops, cafes, restaurants, transport, parks and schools. Every room Is clean, quiet, spacious and light. Fully furnished. House is newly decorated with a new large bathroom. Fully equipped kitchen with modern amenities. Polished timber floors with wool rugs. Laundry plus clothes line. Lovely views of garden and park. General clean of house is done at least once a week by a cleaner. We are next to Johnson Park which has lots of amenities. Arlington Light Rail is also next to Johnson Park. Unique Sideways cafe thirty seconds away. Transport: We are spoilt for choice with transport. Light Rail ( Arlington) three minutes from here (goes to Central or Dulwich Hill Station) Main Rail stations Lewisham, Summer Hill, Hurstone Park and Dulwich Hill all walking distance from the house. Trains from Lewisham only 15 minutes to the city. Bus stops to everywhere 7 minute walk from here. Buses to city, UTS and USYD. House rules: Respect each other and space and off course leave communal spaces cleaner than you found it. We are widely travelled professional/ student. One male and one female. We accept all races, religions, cultures and sexes. Rent is $280 per week for single occupancy. Bills $ 20 per week. Deposit three weeks rent. Rent is paid two weeks in advance. Please feel free to ask any questions you may have as it is to long to list all about us and house. Though we are classified as Dulwich Hill we are on the borders of Summer Hill and Lewisham. 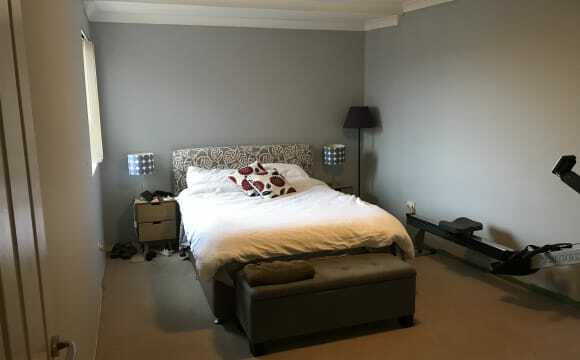 Quiet, clean and fully furnished spacious room in a large three bedroom house . Newly decorated, new bathroom with timber polished floors / rugs. Washing machine, drier and clothes line. Large garden with seating for relaxing etc. Close to all transport, shops, restaurants, cafes, parks and schools. Arlington Light rail three minutes walk from house. Trains to the city 15 minutes ( from Lewisham station ) Bus stops to everywhere 7 minutes from house. Johnson Park adjacent to house . Sideways cafe can be seen from the front. There are two of us male and female professionals. We accept all races, religions, cultures and languages. However this is not a party house. We pride in being quite unless we are all together. Please feel free to ask any questions you have. Only a 2 minute walk to Summer Hill Village, cafes, shops and Summer Hill train station! 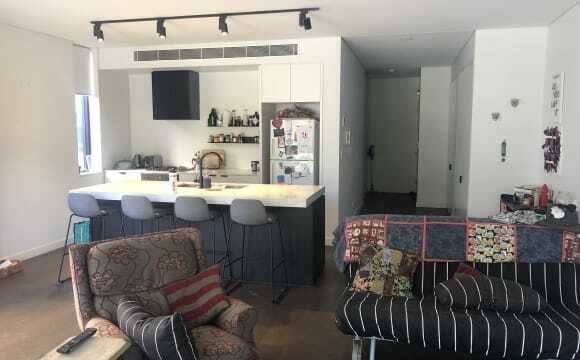 10 min train to Sydney Uni and UTS I have a fully furnished room with a sun room available for rent in a large 3 bedroom unit. This bedroom includes a double bed, desk and built-in wardrobe. - Rent includes all bills (electricity, gas, water and unlimited fast internet) - Fully furnished house - Medium-sized backyard with grass - Freshly painted and polished floors - Brand new fridge, washing machine, kitchen appliances e.g. kettle, microwave, etc. - Lovely flatmates! We welcome anyone including professionals, students and international students! Couples accepted - $360 incl. all bills Feel free to send me a message to organise a time to inspect the place. I look forward to meeting you. 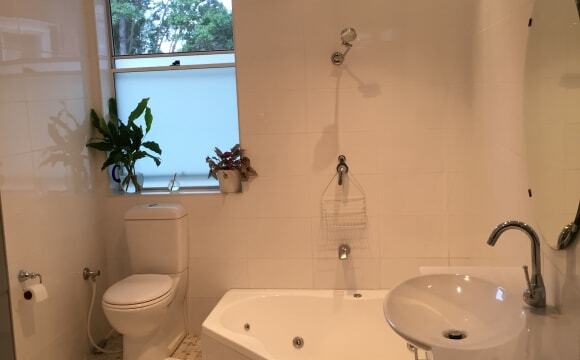 Great sunny rooms, nice breeze, recently renovated and the best shower in the inner west! This is a luxury brand new apartment with views, air conditioning and built in wardrobes. There is a pool,barbecue area downstairs. Internet and Netflix also included. 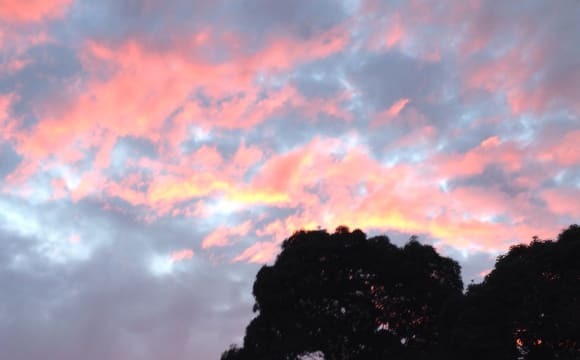 Summer Hill is a great suburb in the Inner West with its own IGA grocery store, Liquor Land, and many cafes and restaurants but best of all: the location! From our house, you have Parramatta road 100 meters away for busses, and in the other direction, you have the train line directly into the city (50 metres away). It takes about 15 minutes to get into the heart of the city so its a quick trip (there are also many night buses if you are trying to get home late at night). All the restaurants and stores are also a 3-minute walk from the house. We have a 3 bedroom house with two rooms available: the 1st room is for a single person $ 260, and the 2nd room is for a couple $310. The house has a perfect layout whereby all the bedrooms are on the second floor with the bathroom and the living/dining/kitchen on a separate floor With WC and laundry. We have a large backyard with a barbecue. We are looking for: - full-time workers or students or basically anyone who is respectful of others and is not a party person. Please don't hesitate to send me a message and inquire further! 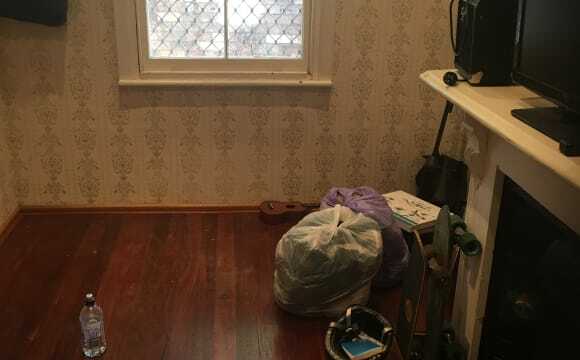 There's plenty of space in this inner-west unit. A big balcony, bath tub, big kitchen and off-street parking. All in the middle of the leafy suburb of Dulwich Hill. Unlimited internet for $30 a month. The house is very large with a big kitchen, lovely outdoor area and wood fired oven in the backyard. All the bills are included in the rent, including internet! If you wish to rent the room to yourself, it will be only $300 a week. The location is great as it is near the light rail, so it is easy to get around using public or private transport. Please contact me directly on my mobile phone to organise an inspection or if you have any questions! Brand new unit on the fifth floor with a balcony and great views. The apartment comes with a fridge, gas cooktop, dishwasher, washing machine, dryer and air conditioning. The room has a built-in wardrobe and nice views. The block is right next to a light rail stop and is a short walk to the 428, 445 and 418 bus stops. There is a nice park across the road with lots of dogs, a basketball court and an outdoor gym. It is also a short stroll to Dulwich Hill shops. This is a comfy room with a queen size bed and WiFi. There is a also a fully-equiped kitchen, toilet bath, laundry, spacious balcony and a living room at your disposal. My place is located in Summer Hill with excellent transport links and great cafes nearby. Summer Hill is a small and peaceful suburb located seven kilometres from the City (or 15 min on the train or light rail). You will love the walkability of the area and the village-like feel. You can enjoy the charming Summer Hill village, where there is anything you need within a 5-minute walk: great cafes, restaurants, pubs, supermarket, pharmacy, bakery, post office, fuel station, ATM’s, hairdressers, gym, medical centre and other amenities. You can also be spotted soaking up the sunshine at the parks, playgrounds and reserves near our place such as Ashfield Park, Greenway Corridor, Cadigal Reserve, Hawthorne Canal Reserve and Parramata River. If you feel like shopping Ashfield Mall and MarketPlace are located less than 2km away, the same distance from two of the most vibrant inner west suburbs with a South European vibe: Leichhardt (Little Italy) and Petersham (Little Portugal). My place is strategically located near public transportation as follows: - two blocks from Summer Hill train station; - two blocks from Taveners Hill light rail station; - one block from a bus stop at Parramatta Rd. New Canterbury Road, Dulwich Hill, Sydney; PERFECTLY LOCATED IN THE HEART OF SHOPPING CENTRE OF DULWICH HILL This huge property with 25 self-contained rooms with ensuite bathroom is located in the hustle and bustle of Dulwich Hill in the heart of Sydney’s inner west and only 10 minute drive from Sydney CBD and is surrounded by only the best cafes and restaurants, gym, medical practices, pharmacies, supermarkets. Large communal kitchen with plenty of bench space, gas cooking and stainless steel appliances Spacious communal area and dining room Reading tables and built-in robes for each room Plenty of additional bathrooms upstairs and downstairs. Abundant storage throughout A double bed or 2 single beds at your choice for each room Close to restaurants, cafes, transport and schools Air conditioning, Built in wardrobes, Gas, Dishwasher, Dryer, Washing Machine, Alarm System, microwave, fridge, TV, Sofas etc. Bicycle cover parking within the property and if you drive, plenty of on-street and free council parking available around the property. 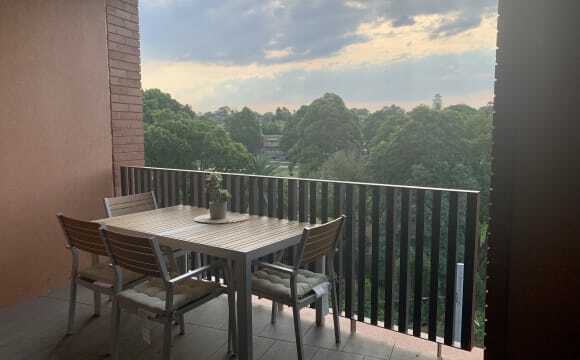 Few min walk to Dulwich Light rail Station and nearby parks, 15 min walk to Lewisham train station and frequent buses every 10 mins at door step to the City; Live in the heart of Dulwich Hill’s main shopping drag - clean, quiet and tidy. This is a great place to relax, live in peace, enjoy a good night sleep and maintain an active life style. This location is definitely the place to live and love your stay in Sydney. Heaps of clubs, pubs, cafes, casual eateries, restaurants, supermarkets -everything is nearby; this is absolutely one of the most sought-after location in the town. 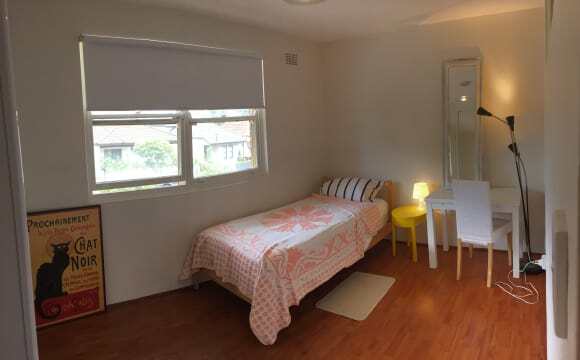 A single bed in a twin room with own wardrobe and table - $175 A private room with a double bed with 2 built-in wardrobes and table - $350 Bond: 1 week rent. All rooms are fully furnished and all rooms come with ensuite bathroom, built in wardrobes and tables; The rent includes all bills including water, electricity, gas, internet (WIFI). All rooms have windows, plenty of natural sun light and fresh air. Unfurnished 3.4 x 2.4 metre room in a bright, airy flat with big windows. Good size living room and kitchen. Nice place to live and great neighbours. 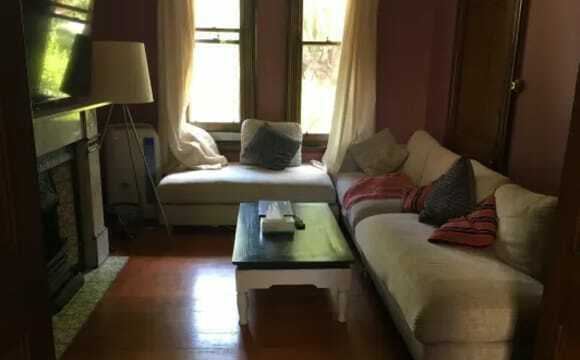 Five minutes walk from Summer Hill shops and train station. Street parking. Central Dulwich Hill. Beautiful Art Deco apartment. 1 minute walk to busses to the city, IGA and lots of restaurants and cafes. All bills included in rent, unlimited internet. Huge TV in common area with google chrome. Beautiful and friendly indoor cat. Really close to train station and bus stop. 12 min train to the city. Biking distance to usyd and uts. Plenty of good restaurants and pubs around the corner.